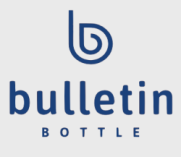 Bulletin Bottle [.com] has a large selection of custom water bottles that are made in the USA. Our USA made custom water bottles are made from Tritan, BPA-free plastic, and aluminum. Choosing USA made water bottles supports our country's workforce, and demonstrates your commitment to the environment and our economy. The environmental benefit of using custom water bottles that are made in the USA over disposable bottles extends beyond the bottle itself. The overall carbon footprint of your project is reduced because custom water bottles that are made in the USA don't have to travel from overseas to reach you. Finally, many of our USA made custom water bottles are union made and printed. If you need, we can add a union bug to your imprint (just let us know! ).